After you add the Tow Info to your shopping cart, please click HERE to add R100B Tow-Away Signs to your order. Or click HERE to add Electric Vehicle R112 Tow-Away Signs. We will email a proof for approval before shipping. Tell us the address and phone number you want added to your sign(s)..
Order R100B Tow-Away Signs Here. Order R112 Electric Vehicle Parking Tow-Away Signs Here. 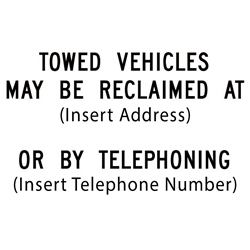 In order to comply with California state law, this sign must include the address and a phone number for where towed vehicles may be reclaimed. The letter height of that information must be one inch.